Karen Vermeren participated at Coup de Ville 2013. This text was published in the catalogue. Karen Vermeren connects processes that, deep inside the earth, form the landscape with processes in the construction of society. The overwhelming beauty of nature stirred her interest in the geological formation of the landscape. She travels to locations above fault lines where tectonic plates clash against one another or move apart. She couples a specific landscape to a given location where she is at work. It is a representation and also an environment wherein the visitor is introduced. 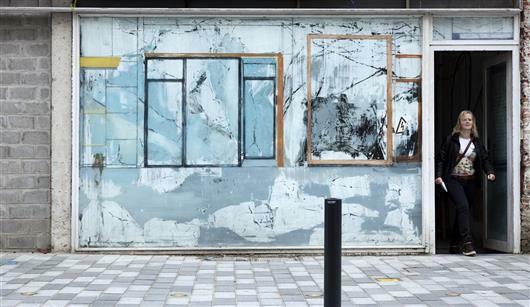 At the fault line between the abstract and the figurative, a special form of landscape painting art is created, mostly on derelict walls and windowpanes. “I make use of the real environment to demonstrate that my subject matter is the here and now,” she stresses. 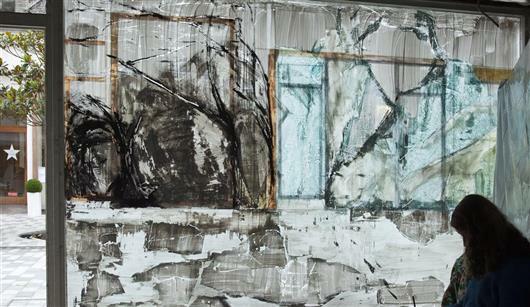 Using tape, pigments, acrylic paint, and plastic, she evokes geological processes that are in perpetual motion. They intermingle with ribbons of tape which she uses to depict formal elements of the architecture or the structure behind the window. Near the NMBS train station in Sint-Niklaas, one finds the permanent work of art by Marin Kasimir that, amongst others, consists of a panoramic photo of the site in New Zealand located exactly at the opposite side of the planet. Hence, Karen Vermeren sought out landscapes on a geological fault line in New Zealand, this time on the basis of photos. Westland Tai Poutini is a national park that features some sixty glaciers. The transposition of this specific geological location to the Stationsstraat and the nearby Ankerstraat in Sint-Niklaas symbolises the ‘glaciation’ of both these shopping streets. On the display windows of (vacant) stores, that are often plastered white as if they are temporarily in a frozen limbo, Karen brings variations of one and the same landscape. The natural phenomenon of thawing, shifting and freezing finds its parallel in the economic fluctuations. Depending on the economy, demography or changing consumer behaviour such as online buying and selling, this also manifests itself as a dynamic process. The project, which will last for a number of months, displays such shifts and is itself shifting. Some of the paintings will already have disappeared when Coup de Ville opens as vacant stores have become occupied.